We are delighted to be joined by Stewart Lewis to chat with him about his latest novel STEALING CANDY. Stewart, how long did you work on STEALING CANDY? 2 years. At first, her captor was an adult, but then I made him a teenager which changed everything and made it less taboo. 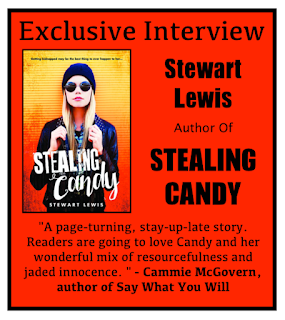 What do you hope readers will take away from STEALING CANDY? The fact that family is not always blood. And that forgiveness is really hard, but sometimes the right thing. I've written ten books, and this will be my 5th one published. It is not an easy road! But it is nice to go into a store and see my book, hold it in my hand, get letters from all over the world from people who love my work. so, in a way, it's worth it! I work mostly in bed, and love to be by the ocean. Luckily, I had friends with beach houses, and now I have my own! Experience life to the fullest and notice everything. A new YA mystery called LOOK CLOSER, where a girl in DC starts seeing names, and it means that person will die that day. With the help of a male friend, she starts to try and save the lives, and eventually the name she sees is her own. Stewart Lewis is a young adult author and singer-songwriter who is based out of Washington, DC and Nantucket, MA. His novels have been translated into five languages and his songs have been used in TV and film worldwide. His favorite things are his french bulldog Oliver, traveling, good food and good friends. 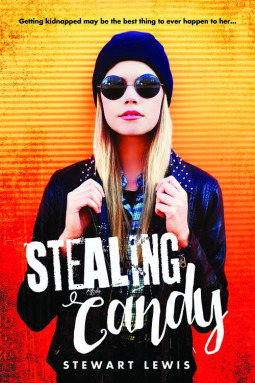 Have you had a chance to read STEALING CANDY yet? How do you think Candy's story would have changed if her captor had remained an adult? Does the ocean inspire you as well? Share your thoughts about the interview in the comments!